The Eastside Theater is staging two beloved stories this spring: a new dramatization of the C.S. Lewis classic "The Lion, The Witch and The Wardrobe" and a wacky twist on the Grimm's fairy tales with Rumpelstiltskin and other favorite characters. The latter will have a special, free performance designed for children with sensory issues such as autism. "The Lion, The Witch and The Wardrobe" is "a great adventure story," said its director Josh Johnson. This version was written by Joseph Robinette. "It's definitely an ambitious show," Johnson said. The C.S. Lewis play is set in the enchanted land of Narnia. It recreates the magic and mystery of Aslan, the great lion, and his epic struggle with the evil White Witch. Four children accidentally plunge through an old wardrobe into exciting and scary adventures in Narnia. The witch is determined to keep Narnia under her control and to end the power of Aslan. The children are caught up in the campaign for good and have exciting exploits. 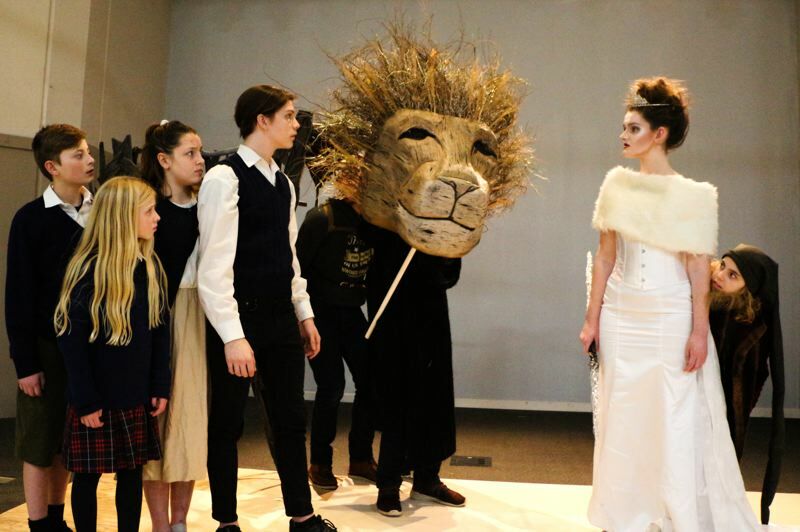 Far from being intimidated by the special effects the play could require, Johnson has upped the ante by creating a forest-themed puppet for the lion Aslan. Aslan will be operated by three puppeteers and voiced by local actor Andres Alcala. Other special effects will be aided by multimedia. There will also be a major battle scene with "lots of sword fighting," Johnson said. "Overall, it's just a magical show," he added. The other play being staged, "Rumpelstiltskin: Private Eye" by Jason Sanford, is a film noir fairytale spoof. "I loved the humor and comedy of the story," said Brandy Nix, the show's director. Rumpelstiltskin was also chosen for practical reasons. The sets for the two shows can be easily modified to fit each play. In Rumpelstiltskin, Fairytale Land has been hit by a crime wave. The Three Bears' home was broken into. The Three Little Pigs' homes were destroyed. Now Little Red Riding Hood's grandmother is missing. The crimes seem unrelated, but could an evil mastermind be behind them all? Only hard-boiled detective Rumpelstiltskin and his wise-cracking partner, Ugly Duckling, can solve this wacky case. The play is full of silly, familiar fairytale characters and snappy one-liners and is fun for all ages. The Eastside Theater folks attended a Northwest Children's Theater sensory production and decided they would tackle a sensory production for Rumpelstiltskin, Nix said. "We're lessening the noise impact," she explained, and also dimming lights in the production. Nix said that at several points in Rumpelstiltskin, characters throw comic and exaggerated temper tantrums, complete with screaming and jumping around. These episodes will be toned down, eliminating the startling, loud noises and rapid movements. The Eastside Theater Company, formerly known as Corbett Children's Theater, provides training for young actors ages 4-18. The aim is to provide professional-quality theater for audiences of all ages. 7:30 p.m. Feb. 28, March 7. 4:30 p.m. March 2, 9. There is a special sensory performance of Rumpelstiltskin 4 p.m. Sunday March 3. This performance only is free. Eastside is working with FACT Oregon to distribute tickets to families with kiddos with sensory issues. 7:30 p.m. March 1, 2, 3, 8 and 9 and 1 p.m. March 2 and 9 and 4 p.m. March 10. For tickets visit eastsidetheater.com/ or call 971-231-5032.